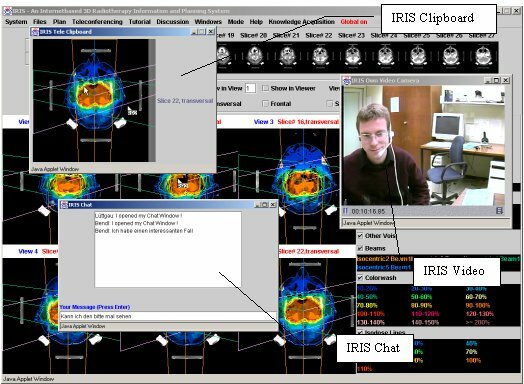 With IRIS we want to support physicians in radiotherapy planning by providing therapeutic knowledge and experience via the Internet. It will also be a resource where students will be able to learn about treatment and planning techniques in radiotherapy. Atlas of Dose Distributions offers preoptimised treatment plans suitable for given tumour locations. The plans presented can be evaluated by the therapist. 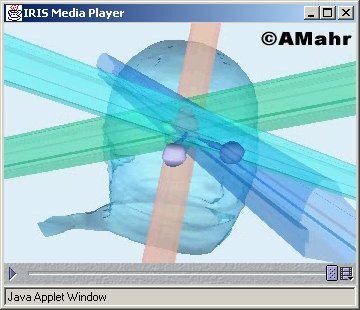 Therefore medical images, three-dimensional views, histograms and statistics are provided. Besides sample plans, the atlas is able to show plans generated at runtime by a knowledge based system (see TAPIR). The plans generated match a specific patient case which can be specified in advance by the therapist. Tutorial. 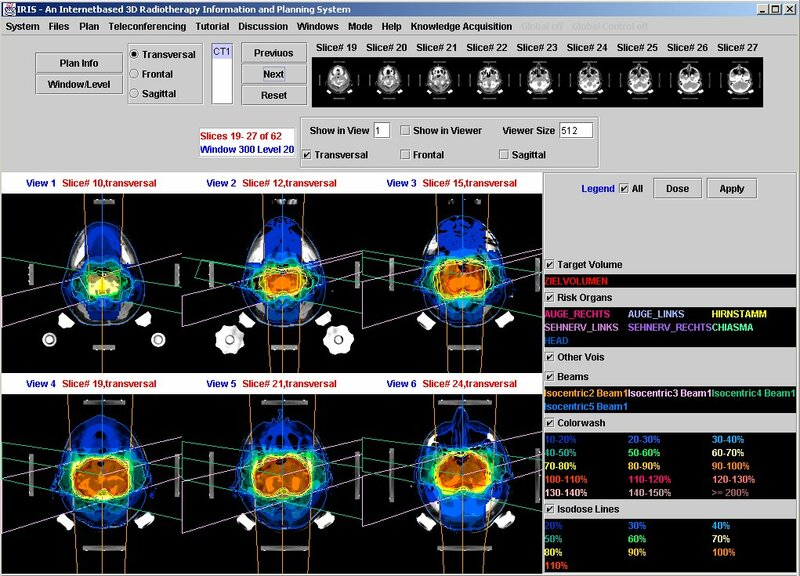 A hypertext oriented multimedia tutorial offers basic knowledge about methods of radiotherapy. With the aid of a guided sample plan, the basics of treatment planning can be learned in an interactive way. Teleconferencing. Plans can be discussed and modified together with remote colleagues in a teleconferencing session. This component can also be used by students for remote learning. Discussion Forum. The discussion panel can be used by therapists to get help or comments about specific problems from other colleagues. This panel can also be considered as a communication board for radiooncologists, as well as an interface to offer ones own knowledge to IRIS. The knowledge offered can be published by the atlas of dose distributions or the tutorial. IRIS is an Internet based client-server system. The client part is purely written in JAVA. For communication with the server CORBA is used. To store the presented knowledge a knowledge based system and a database are connected to IRIS. The client can be downloaded as a Java applet using an internet browser. The applet has been successfully tested with Netscape 6 and Microsoft Internet Explorer 5. Once started, the applet and the application connect automatically the server via the Internet. The only system requirements needed for using IRIS are the installation of one of the above mentioned internet browsers and an Internet connnection. Currently, IRIS is running for testing on the intranet of the DKFZ (German Cancer Research Center Heidelberg). Some parts of the system are still under construction. Next we are looking for partners who would like to test IRIS together with us. When the necessary tests have been done, IRIS will be opened for public on the Internet. 2D View The image cube can be regarded in "light box" view. 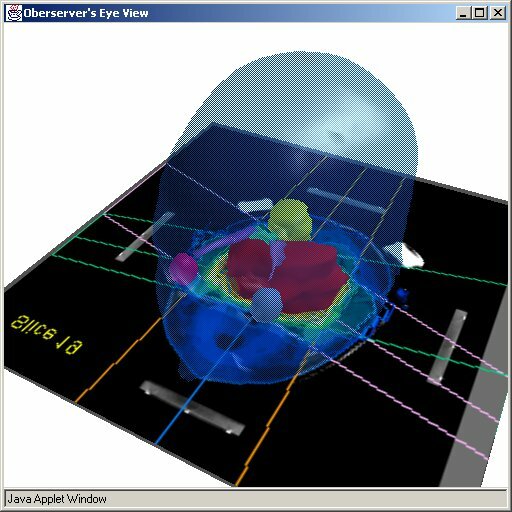 By selection, images can be zoomed and the dose distribution,contours of beams, organs at risk and target volume can be seen. 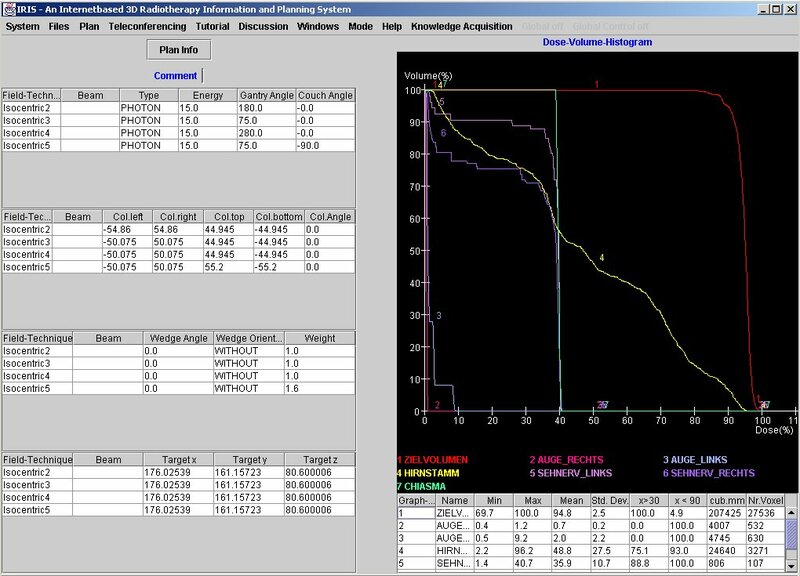 DVH Technical parameters, dose-volume histograms (DVHs) and DVH statistics are available. 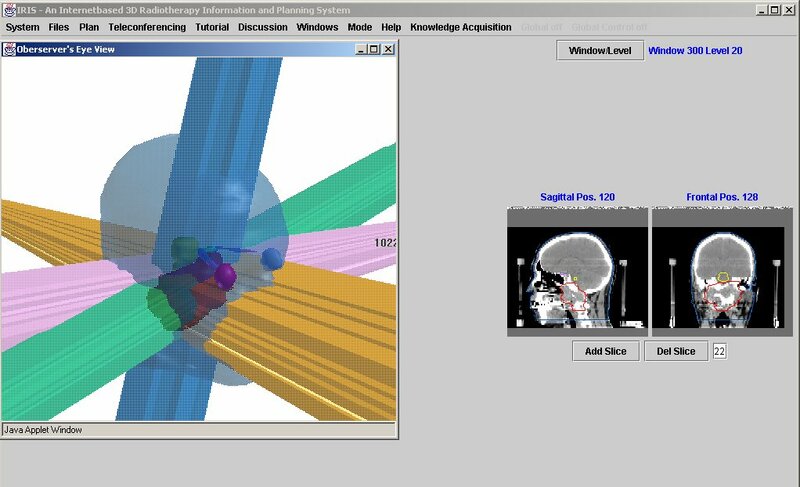 3D 3D views give an impression of the spatial relation between the tumour, organs at risk and beams. 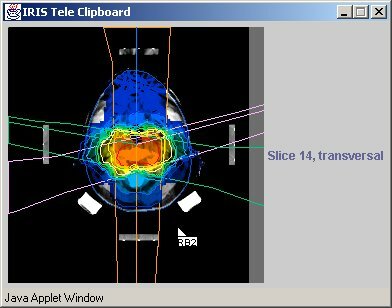 3D Slice Transversal slices can be selected by clicking on the corresponding position in the sagittal or frontal view (see left screenshot). The selected slice will be blended in the 3D scene. Videos can be regarded with integrated Media Players being written in Java. 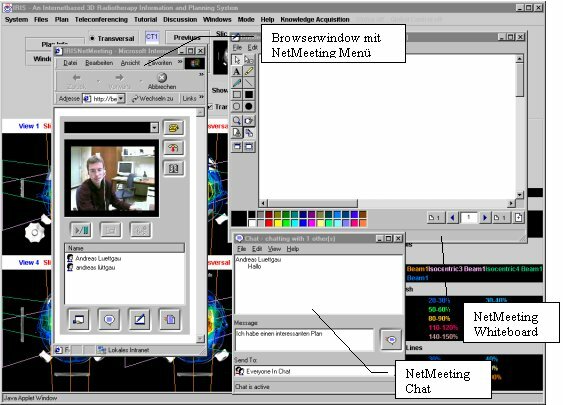 Microsoft NetMeeting is integrated. It can be used for teleconference sessions with IRIS. IRIS Teleconference In addition to NetMeeting IRIS provides an own solution of a teleconferencing tool. Unlike NetMeeting this solution is independent of the used operating system and it provides more flexibilty in usage of the system. It is implemented using the Java libraries JMF and JSDT. The clipboard of the Java teleconferencing tool. Every conference participant has an own cursor with his initials to show or explain something to the other participants. Protocol : Plans can be modified. The modifications are automatically recorded by the system. In addition the user is able to append entries manually. 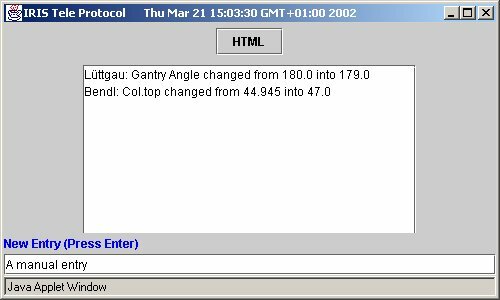 The screenshot shows the shared protocol of the Java teleconferencing tool. Protocol (HTML) After writing a protocol (left screenshot) a HTML page of this protocol will be automatically generated by the system. 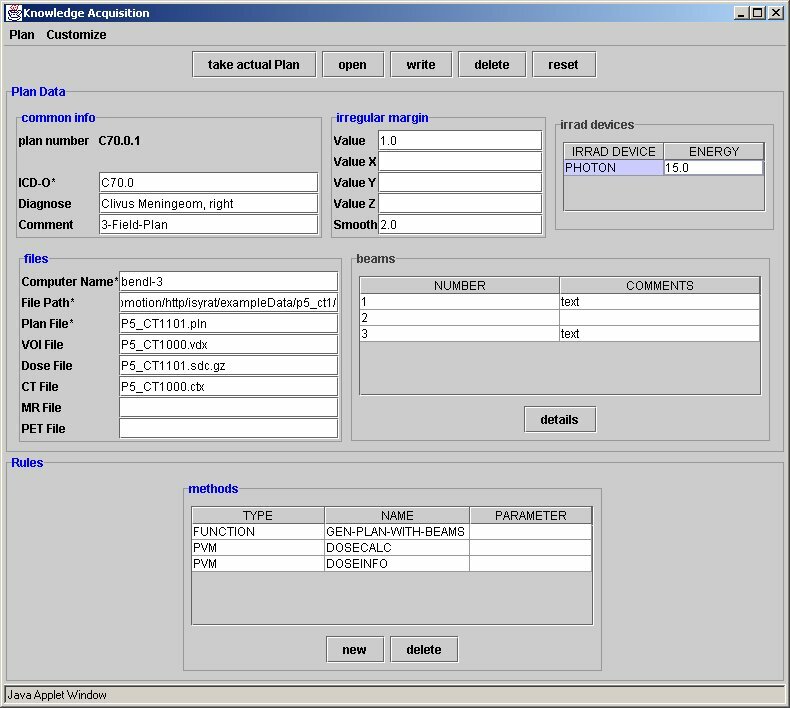 Knowledge Acquisition With the internet based knowledge acquisition tool it is possible to edit the knowledge base of the knowledge based system TAPIR, which is connected to IRIS. The author thanks Professor Dr. Reinhard Männer, Institute of Computer Science V, University of Mannheim, Germany for the scientific support of this project.